What a big bold can of joy this is. Neon bright, noisy and boisterous, it’s super fresh and lip puckeringly bitter. It’s been named after Swervedriver, a brilliantly bright, noisy and boisterous band that I remember from my twenties and who have recently reformed and released what I am told is a great new album. This isn’t an officially brewed beer, just named this way as Cameron and the Turning Point gang are fans. Anyhow, the beer pours a peachy gold and smells of apricots and mangos and, taking a mouthful you find a delightfully soft and subtle fresh doughnut, waffle and honey malting before the big blast of Centennial, Amarillo and Mosaic hops turn you on with masses of zingy lime zest and richly woody tobacco leaves, fizzy lemon sherbet, sticky orange marmalade and steely dry herbal greenery. 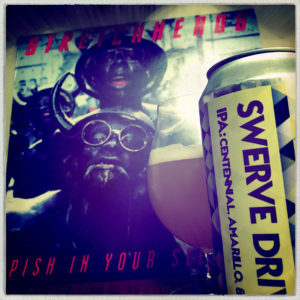 When he sent me this beer, Cameron asked me to pair it with some music and I’ve decided not to go the Swervedriver route as that would be far too obvious. You should have paired it with the obvious: Son of Mustang Ford!